I’ve been wanting to make a quiche for quite some time, and I’ve had an extra whole wheat pie shell in my freezer for too long. 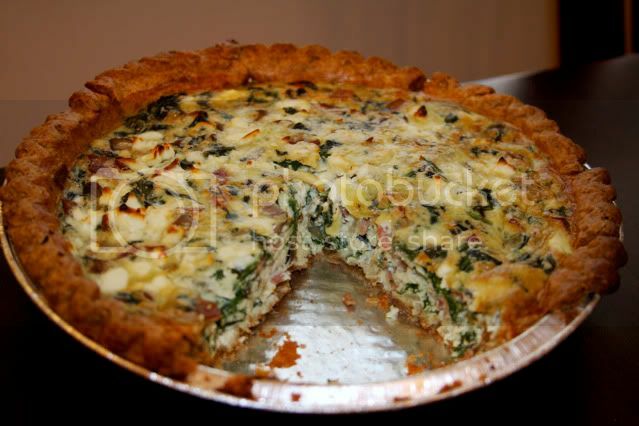 A quiche is a great meal because it’s really adaptable to what you have on hand. I couldn’t really find one specific recipe I wanted to follow, so I used this Health magazine recipe as a guide. If you check out that recipe you can see I didn’t follow it too closely! I’m not one that’s big on making up my own recipes, because so often I’d rather follow one, and have a little more confidence that it will turn out right. But I’m really glad I went for it with this recipe. If you’re like me, and timid with your skills, a quiche is a great dish to experiment with. Step out of your comfort zone, and try it! Or, if you’re not ready for that just yet, follow this recipe, because I can assure you, I wouldn’t change a thing about it! This one’s a keeper. The flavors in this went very well together. Feta has a great salty flavor, and the spinach and mushroom have an almost savory sweet taste. Both The Boy & I love turkey bacon, and it’s all we eat now. I wasn’t sure how well the flavor would stand up in this dish, but I think it was pretty pronounced. A perfect combo. YUM! Preheat oven to 375°. Bake pastry shell for 8-10 minutes or until browned. 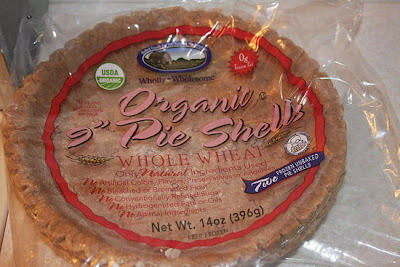 Remove shell from oven, and set aside. Leave oven on. Chop turkey bacon and saute in a skillet over medium high heat until slightly crispy. Remove from pan and set aside. Heat oil over medium to medium high heat. Add onion, saute 2-3 minutes until tender. Add mushrooms & spinach. Saute 4-5 minutes until spinach is soft. (Mine got a little watery, so I kept it on heat until most of the moisture had cooked out.) Add turkey bacon back to the pan and stir to combine well. In a bowl beat eggs, egg whites, and half & half (I did this in my Magic Bullet Blender, and then poured it in the bowl). Season with salt & pepper. Add in veggie/bacon mixture and stir to combine. Add feta, stir to combine, and pour into pie shell. Bake 20-30 minutes or until completely set, and slightly golden & crispy on top. Oh yum! I've been wanting to try a quiche for a while too. This looks soooo good! This looks great. I've never seen that pie crust before but I'll have to try and find it! This looks delicious! I love that combination of flavors. mmmm I've been wanting to make a quiche too! I think i'll have to try this one! I'm getting tired of my scrambled eggs, or my breakfast sandwiches (although they are delicious)…and ever since we had the quiche at Jamie's I've been wanting to try it out for myself. I'll let you know how mine turns out when i make it! I am a big fan of quiche. I am sooooo making this tomorrow. Thanks for the inspiration! 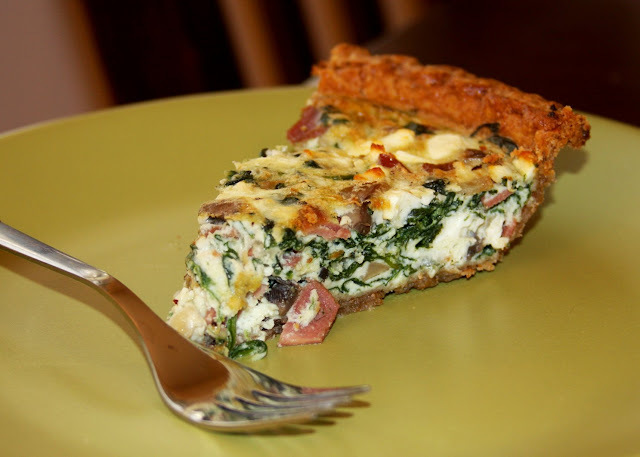 This looks delicious – great flavors for a quiche!